The camera properties display is where the application displays camera properties and where the user can change them. The camera properties are grouped into categories and they depend on connected DSLR camera vendor and model. Camera mode button – this is a Nikon only property. ‘host mode’ – in ‘host mode’ the application takes full control over the camera and the user can change all the properties from the application. While the camera is in ‘host mode’ the camera dials/buttons and the camera capture button are disabled. Capture history button – with this button the user can show/hide the capture history display. This category contains button for camera properties related to focus and metering settings. Focus mode – pressing this button the user can change the camera focus mode. Note: ‘MF fixed’ means the auto focus is disabled on the attached objective or the objective does not support auto focus. 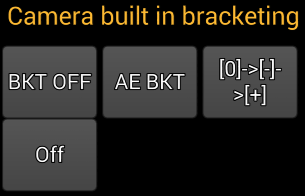 Custom bracketing overview – here the user can see what shutter speed or exposure correction will use the application.